Beth Orton’s fans have been waiting for years for a record like Sugaring Season that makes good on the promise of her early recordings. It’s hard to believe that it was over a decade and a half ago that Orton first attracted widespread attention in her native England by singing on a William Orbit remix of John Martyn’s classic “I Don’t Want to Know About Evil.” Her first two albums Trailer Park and Central Reservation—along with David Gray’s White Ladder—are classics of the era whose groundbreaking blend of folk, pop and electronica textures has aged surprisingly well. Those albums established Orton’s reputation as a great stylist who wrote thoughtful lyrics that expressed a mixture of her personal, spiritual and political concerns. More than perhaps anyone else, her songs captured the restlessness, yearning and uncertainty of the fin de siècle as they expressed a mixture of ancient folk and cutting edge electronic grooves. It was a hard act to maintain, and by the time Daybreaker came out in 2002, a certain strain was beginning to show even though many of the songs on that album were quite good. And, when Comfort of Strangers was released in 2006 with its more folky, acoustic sound, it was clear that Orton was beginning to lose her sense of direction. Like its predecessor, the album had some great lyrics and interesting melodies, but the whole affair seemed listless, sludgy and unfocused. 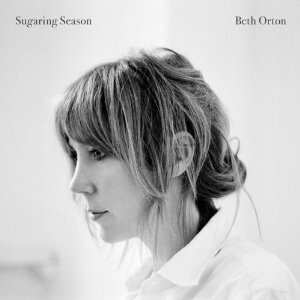 Now that over a half-decade has passed since the release of her last album, Beth Orton clearly has a lot riding on Sugaring Season and thankfully, after listening through each of the songs over a dozen times, the news is all good. The slow descent into torpor and sonic despair that many people were expecting is nowhere to be heard as surprisingly, Sugaring Season emerges as the most beautiful, uplifting and cohesive album Beth Orton has ever recorded. Of course some of the credit must go to producer and multi-instrumentalist Tucker Martine (Decemberists, Laura Veirs, Bill Frisell) who along with such heavyweights as Brian Blade on drums and Mark Ribot (Tom Waits) on guitar create beautiful acoustic soundscapes for Orton to sing over. And sing she does, really sing, and that’s what sounds so different this time around. For, Beth Orton has always had a rather pretty voice, but in the past, it often sounded as if she was holding back, and her vocals often came off as moody and stylistically appropriate at best. It was as if she was afraid to delve into what her voice was capable of, so her singing sometimes had the effect of skating over a very hard surface, and the depth of the lyrics was never reflected in her vocal delivery. But that’s changed. On every song in Sugaring Season, the attitude and poise that often substituted for vocal perfection has been replaced with a fearless attitude towards singing. She’s unleashed her voice and no longer sounds afraid of the emotions, nuances and places it can go. Even a perfunctory listen through songs like “Magpie,” “Candles,” or “State of Grace” reveals a singer who no longer hesitates to plunge headfirst into the emotional heart of her lyrics. And, better still, she no longer appears to take her sorrow so seriously and sounds as if she’s finally learned to laugh at herself, a stance that makes songs like “See Through Blue”—that could’ve sounded like a trainwreck if it was given a different treatment—hugely appealing. More than anything else, on Sugaring Season, Orton explores an emotional range that has been missing from her work as in the past she had the tendency to crowd her music’s emotions into a powerful, but small, cramped and rather dreary area. But her old fans don’t need to worry that she’s about to go neck-in-neck with Taylor Swift or Mariah Carey in a race to the top of the charts just yet; with song titles like “Poison Tree” or “The Last Leaves Of Autumn” there is more than enough moodiness and melancholy imbued in the record’s grooves to keep them happy. Sugaring Season is the Beth Orton album people have been waiting for. Blessed with great songs, wonderful arrangements and vocal performances that seriously raise the bar in our expectations of what she’s capable of, it is a record that shows real artistic growth in every area and is destined to become a classic that rivals Trailer Park and Central Reservation.